A couple of weeks ago I've written an article about how I managed to hook several apps together so I can do some lead generation while curating content online. Although it worked it was a bit technical (it still is) so I thought about shooting a video explaining how to do the setup etc. 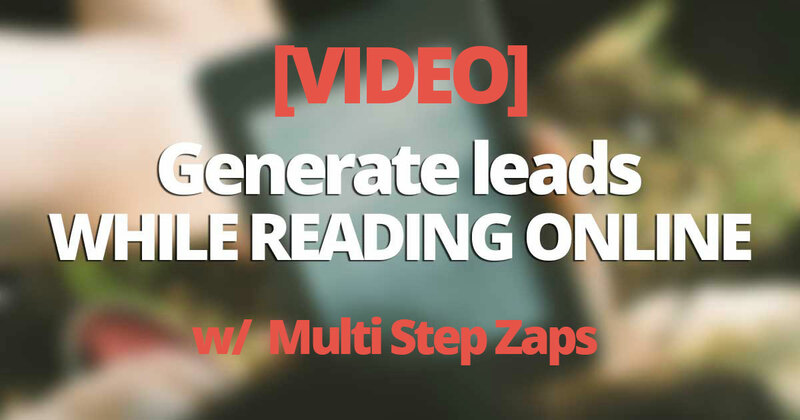 But during that time, Zapier released a very cool feature called Multi-Step Zaps. So this article is an update of my process, making full use of this new feature, and most of the content is in video. In this video, I'll show you how I've hooked Pocket, Snip.ly and Buffer together using Zapier and a custom python script to get this running. It's simple, contained in Zapier and once set up, makes a painless way to curate content and leverage this at a whole new level. You'll need accounts on these platforms. You can get away with free accounts for all of them except for Zapier, where you'll need a premium account to enable the Multi Step Zaps (but you can try this out with a free trial). Don't forget to change the auth token and the campaign id. So I've used this in product for the last 3 weeks now and I've made some changes. Basically, I don't need to load data I won't act on with my script. Thanks to the multi-step feature, you can actually pull data from the first step at each step. Meaning my script will just transform the URL through Snip.ly and return it and I can still get the Pocket data 3 zaps later. The second part of the update is fully leveraging the power of multi-zaps (I think I can still go deeper in the rabbit hole but here's the updated process, which is a good start). It's a good way to find interesting content, so I use them every morning to fill my Pocket. Hope this helps. Let me know what you think, the video is not of the highest quality and listening to myself is a bit painful right now, but I'd love to experiment more with it, it's a wonderful tool to convey technical notions more simply. If it's still too nerdy, sorry. 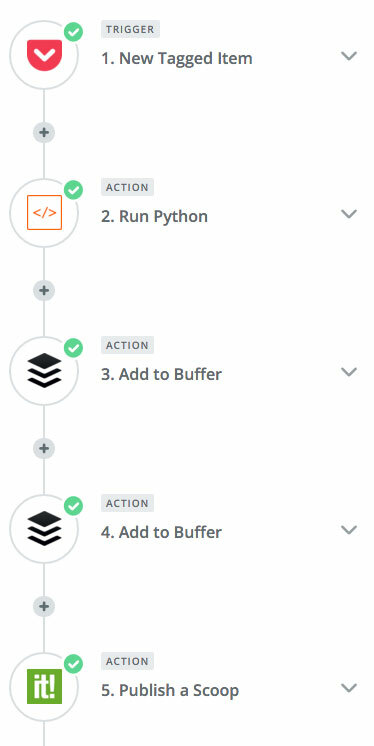 I'll update this post when there are other ways to do what's done here (easier access to the Snip.ly API or a different integration with Zapier to grab the link with the Snip.ly CTA).